Several years ago as I was cleaning up from Christmas Eve dinner, I followed the suggestion of my mother-in-law and froze the ham bone from the ham we had just enjoyed. I had never done this before, but into the abyss of my chest freezer it went. I had hardly ever cooked with a ham bone, yet I decided it would be worth a try. Fast forward to a couple of months after putting the ham bone in the freezer, and I received a flier with a coupon in the mail from Honey Baked Ham company advertising ham bones for bean soups. When I saw the flier for the ham bone, I remembered the bone that I had stashed away in the freezer, and I knew it was time to give cooking with my ham bone a try. The outcome was delicious. Now anytime we eat a ham (whether it is a Honey Baked ham or a cheaper variety I get at the grocery store or Costco) I always wrap and freeze the bone for future use. Fortunately, last week when the frigid temperatures outside called for a warm homey meal, I had a bone in the freezer from Thanksgiving. White bean soup was a go. (I don’t like to get out when there is snow on the roads so cooking from my freezer/pantry was a plus.) 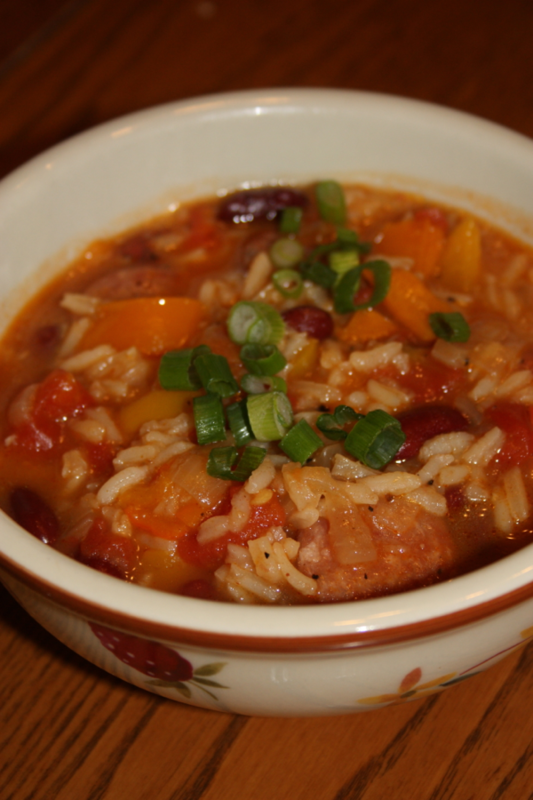 The recipe is super easy and once you have the beans on the stove simmering there really isn’t much work. I served mine with cornbread, but a salad would have made a nice addition. My children loved them. Tyler preferred his beans without the chunks of ham (and tons of black pepper) so I graciously fished the ham out of his bowl and added it to mine. 1 pound dried navy beans (I do the quick soak method on the bag but you can soak them overnight as well). Soak beans using either overnight or quick soak method. Quick soak for beans: Rinse and sort beans (remove any rocks or weird looking beans) in a large pot. Add 6-8 cups of hot water. Bring to a rapid boil; boil for 2 minutes. Remove from heat. Cover and let stand 1 hour. Drain and rinse beans. Overnight soak: Rinse and sort beans in a large pot. Add 6-8 cups of cold water. Let stand overnight or at least 6-8 hours. Drain and rinse beans. After soaking the beans, rinse and drain them. 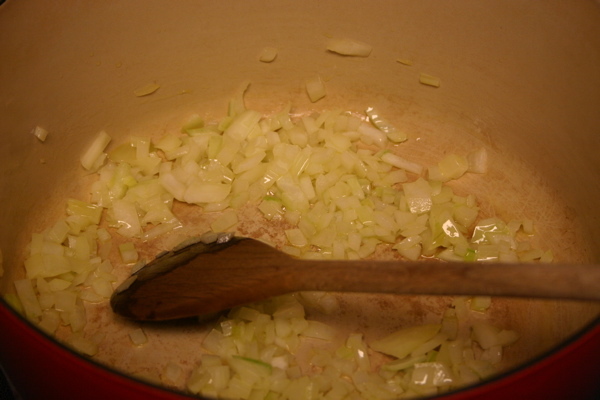 Then, in your stock pot, add some olive oil (1-2 tblsp.) and saute your onion. When the onion is getting soft add your beans back to the pot and add you chicken broth, about 2 cups of water and your ham bone. I didn’t add any other seasoning but feel free to add for your taste. Now all I did was simmer it for 4-5 hours. 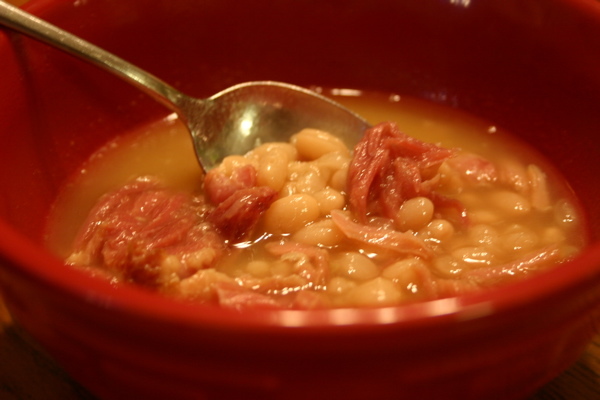 Before serving, remove the ham bone and shred any meat and add back into the soup. Serve with cornbread or corn muffins. Softened onions ready for the bean addition. 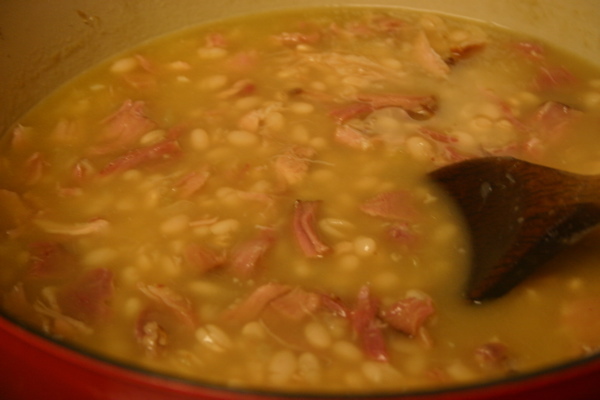 White bean soup ready to serve. 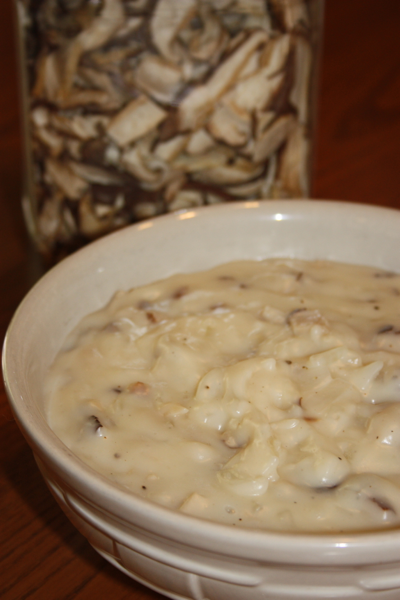 3 Comments on "White bean Soup"
I will have to try biscuits with apple butter next time I make the soup. Thanks for commenting.